I came back from a business trip with a box of tissues, cough drops, and a sore throat that wouldn’t pass. By day 4 I developed a hacking cough so I eventually gave in and went to the doctor. Well, there I was, 2 ear infections and bronchitis and my other half had just left for New Zealand for 2 weeks. I was miserable. After a hot shower and a little dusting off, I decided to end my pity party and headed to the store for some key ingredients. With all my congestion I wasn’t able to taste anything. I know, my worst nightmare. So, the traditional chicken noodle soup was going to need a little kick. I made a twist on the original with a little heat and some Italian sausage. It’s as if gumbo and chicken noodle soup had a child. On day 1 I wasn’t really able to taste it, but it did have a great combination of textures from soft vegetables and tender meatballs swimming in a warm, silky broth. I figured I’d let it stew overnight before adjusting the spice, in hopes my taste buds would make a quick recovery. Thanks to some antibiotics, prescription strength cough syrup and decongestants, I woke the next morning to the fragrant bouquet of rosemary and Italian sausage seeping through the house. Ok, I’ll admit it, I had it for breakfast. I just couldn’t resist!! The hint of spice and cumin, mixed with the expected aroma of thyme, rosemary and soft tender chicken was a welcome home. By the end of day 2 I feel like a new person. It has everything I needed in one bowl to fight back, who can ask for more than that? I packed up my weeks worth of lunches, and as long as I stop sneaking into the refrigerator for another bowl it should last me until Tuesday. Place in large stockpot and add onion, celery, garlic, bay leaves, cumin, thyme, rosemary, salt, peppercorns, and bullion cube. Don’t worry about chopping anything nicely, this is just to flavor the stock and it will all be strained out when the stock is ready. Once boiling, bring heat to low and simmer for 2-2½ hours. The longer to simmer the better the flavor. You can always make the stock the night before and let it sit overnight in the fridge. Then you can strain it in the morning and you’re ready to make your soup. Place stock back on stove and turn off heat. Let sit for 10 minutes and then skim some of the extra oil off the top. No need to go crazy, just skim some of the extra. Let the chicken cool about 15 minutes. Carefully remove and discard skin and bones and shred chicken with a fork. Sprinkle shredded chicken with cumin, paprika, and cayenne pepper. Mix spices into chicken and return to stockpot. In a sauté pan, cook onions and garlic in a tbsp. of olive oil. Sauté on medium~high until slightly golden (about 7 mins). Add onions and garlic to stock along with celery, carrots, and potatoes. Use the same sauté pan for the sausage. Remove sausage from casing and drop small bite size balls into pan and cook until slightly golden. Remove sausage from heat and add directly into stock. Add bullion cube and tomato paste, stir and let simmer. Let soup simmer on medium~low for 1 hour, taste and add salt/pepper if necessary. Serve and sprinkle with cilantro and Parmesan cheese. I ran out of Parmesan so decided to try it with a little French feta crumbled on top. Let me say, it’s worth trying! The salty bite was perfectly balanced with the warm spice of the soup. The secret ingredient in this recipe comes from my mom. Growing up she would make this for “family dinner” night and inevitably it would result in no leftovers and everyone asking for more. 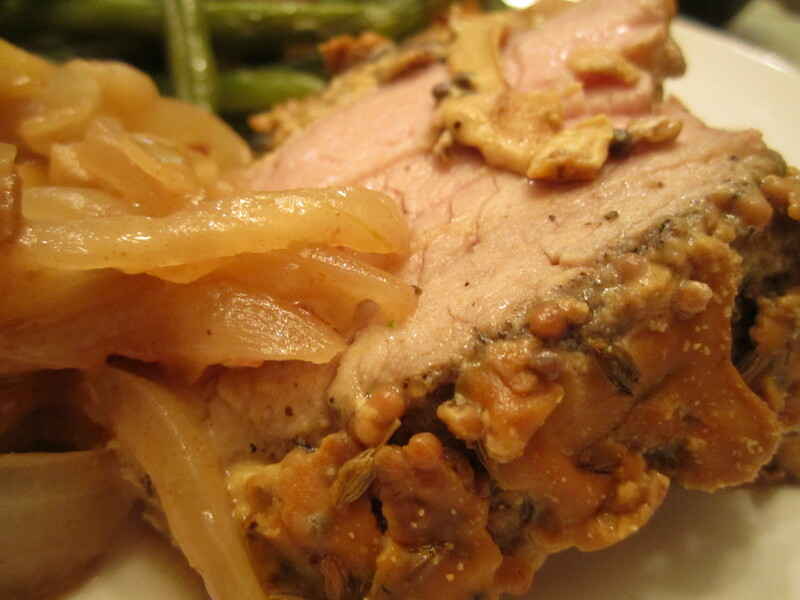 Pork tenderloin was always one of my favorite dishes until I left home and had it in several restaurants and prepared by others not known as my mom. Dry, bland, tough and disappointing. It was never the same. So, there was only one thing to do… I replicated my mom’s method and added a few of my own touches, and it’s now become a staple in my home. Every time I make it the smells and flavors bring me back home to Sunday night dinners with my family. It was our one night a week we would have a “proper” dinner, which my mom defined as, one, being in the “nice room”, two, using cloth napkins, and three, using double the plates (half of which didn’t go in the dishwasher). I know because I was the designated plate dryer as my dad dunked them in scalding hot water and pass them to me with bright red fingers. I dedicate this post to my family, and hope that it becomes a tradition in your home too. While the oil heats up, sprinkle the pork tenderloin with salt, pepper and rosemary. Rub the spices into the meat so they don’t fall off when you drop it in the pan, it really helps flavor the tenderloin. This is your only time to season it, so if you don’t add it now it will be too late. Place tenderloin in hot pan and sear on all sides. 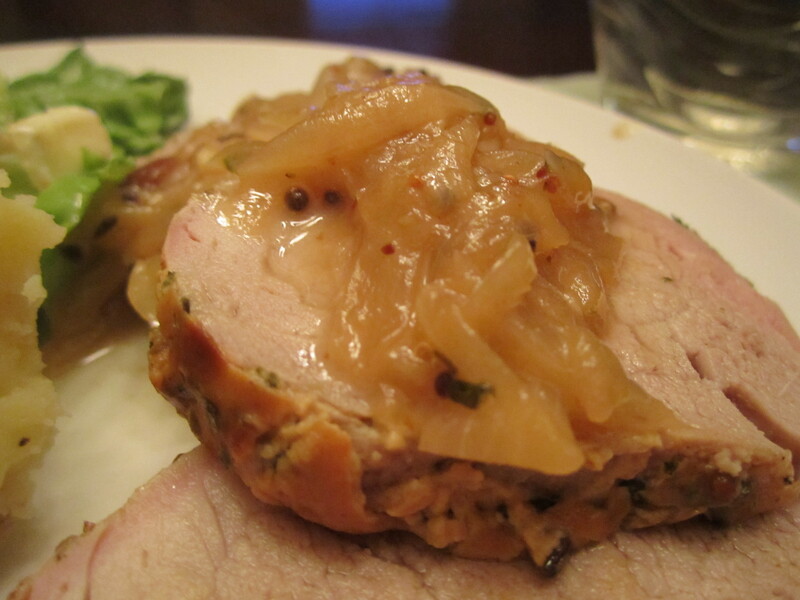 The mustard seeds and fennel will stick to the sides of the pork as it sears. Sear the pork, approximately 3 minutes per side, and remove from pan. Set in a roasting pan on a wire rack. Let it cool for a few minutes, and then spread a thick layer of Dijon mustard over the entire tenderloin. You might need more than 3 tbsp. Just keep spreading it on so you cover the top. While the meat cooks it’s time to make the topping! In the same skillet used to brown the meat, add sliced onions, garlic, salt and pepper and cook on medium/low until soft and translucent. You may need to add a little more oil to avoid burning. Add ground mustard, mustard seed, Worcestershire and a splash of water and continue to cook down for 10 minutes on low heat. You want to caramelize the onions, which is a slow and delicate process so be patient and let them cook down at a low heat. Add jam and butter and stir well. Once it’s ready, cover leave on low heat. If it’s under put it back in for 10-15 minutes and check again. It depends on the thickness of the tenderloin, so it will vary every time. Once the meat has reached the right temperature remove from oven and let cool for 5-10 minutes before slicing so the meat juices have time to redistribute. If you cut it right away all the juice will run out of the meat and give you a very dry piece of tenderloin. This pork is flavorful enough to eat on it’s own, or add a topping, or just a simple spoonful of applesauce. 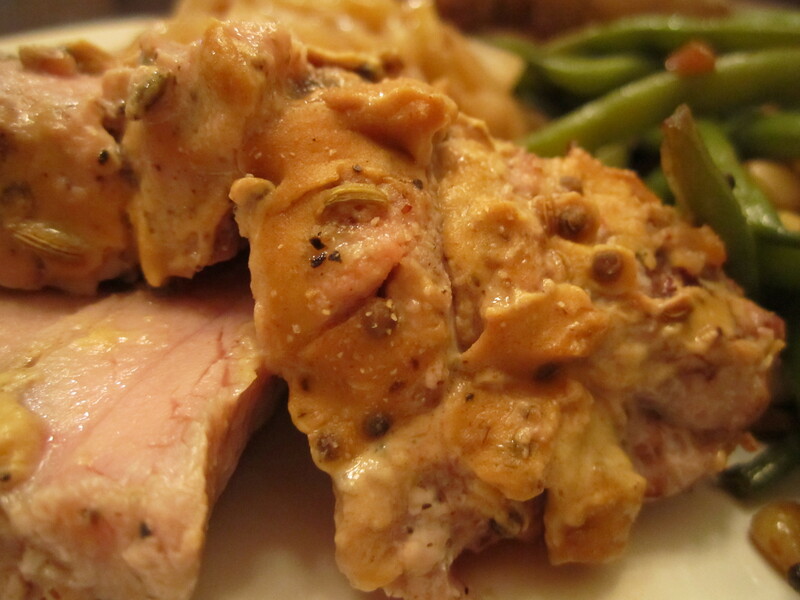 The spicy mustard keeps the pork moist and adds the perfect amount of heat to the delicate tenderloin. Below is an alternate topping my loving boyfriend made for the following evening. The dates disintegrated in the warm sauce resulting in a sweet jam like marmalade. There comes a time in every couple’s relationship where one person says, “Oh, let’s have insert dish here for dinner” with a giddy, child-like smile… and the other person looks at them with a face like their trying to solve a very complex math problem. Well, this happened to me when my boyfriend asked for “chicken and dumplins”. Chicken and what? My parents are British; I grew up eating pot roast, shepherds pie, sausage rolls and bubble and squeak. I felt like I’d walked into an episode of Walker, Texas Ranger. I thought it might be something like Matzo ball soup, which is really isn’t, so I got my lesson in dumpling creation through unscripted directions from my boyfriend’s grandmother over the phone. It was less than vague… something along the lines of “mix a little flour with some Crisco until it looks right”?!? Regardless, I think I figured it out and I’ve been trying to master it ever since. 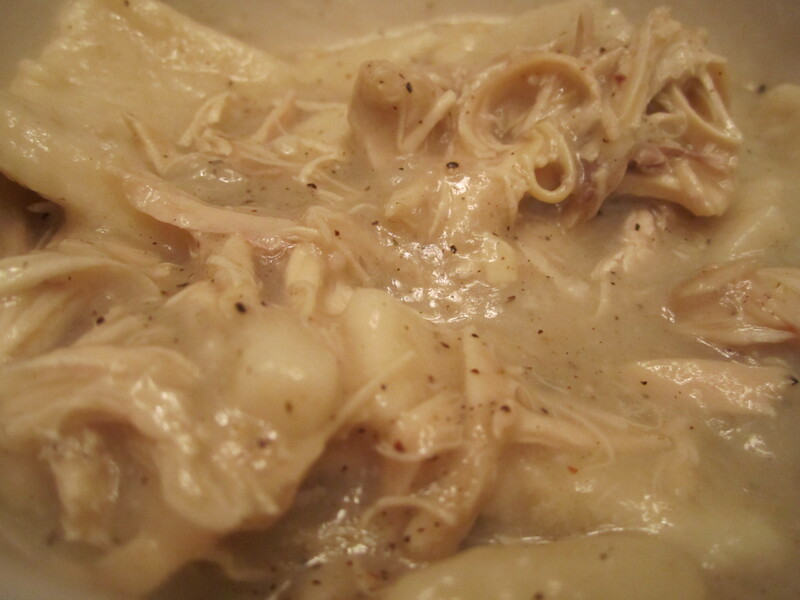 Chicken and dumplings, like most southern food, evolved out of necessity and practicality. In the old days, chicken was a special treat and not readily available like we find today in our grocery stores. When it was available, chickens were often scrawny little birds without a lot of meat, yet had the job of serving an entire family dinner and lunch the next day. However, flour was in abundance and an affordable staple found in all household kitchens. Flour could easily be used to stretch a meager meal so that an entire family would leave the table feeling full and satisfied by making biscuits, dumplings, bread or an assortment of other improvisational meal stretchers. Today, chicken and dumplings has become an ultimate comfort food of creamy sauce, thick luscious dumplings, and shreds of moist chicken. I like mine with lots of pepper so the sauce is speckled with little flakes of black and charcoal. Now I’ll say up front this is a work in progress, I’ll keep you updated on my adjustments but overall this recipe delivered a very satisfying dinner. I should also mention this is not a weeknight dinner. It takes a bit of time so I recommend making it over the weekend, or if you decide to do it during the week, split it up into two nights and make the stock the first night and the dumplings the second. Enjoy your time off, and leave the stove to do all the work. You don’t need to do a thing! I usually transfer the stock into a Dutch oven pot so I have more room to drop the dumplings later. I have one from target and I use it ALL THE TIME! I highly recommend purchasing one of these, you won’t regret it. Kitchen Essentials® from Calphalon® Hard Anodized Nonstick 5-qt. Covered Dutch Oven. When the chicken is cool enough to handle, pull the meat off and discard the skin and bones. Shred it with your hands and leave it on the side until the dumplings are ready. Return stock to the stove and bring to a low simmer. I usually reserve some of the stock on the side, I don’t use it all and then I can make another soup later that week. Skim some of the oil off the top before you drop the dumplings, it helps your soup stay creamy and not oily. Part 3 – It’s dumpling time! Cut in shortening using a pastry knife or a large fork. Pastry makers mix in the shortening using their hands, this is my preferred method too – dip your hands in ice-cold water for a minute, then dry your hands; it helps to not melt the Crisco and the dough doesn’t stick to your hands as much. Add cold milk and beaten eggs, a few spoons at a time, mixing the dough from the outside in with fork until a soft dough forms (do not over mix – about 2 minutes total). You may need to add a small amount of milk or flour at the end to adjust the consistency of the dough. Add milk if the dough is very dry and crumbly after it’s been mixed; add flour if the dough is very sticky. Sprinkle your work surface with flour to prevent the dough from sticking. Roll dough out thinly, about 1/8″ thick, then slice into strips, each about 2 inches in length. Lightly dust with flour and then gently drop the dumplings into the simmering chicken broth. Check consistency and then add 1-2 tbsp. corn starch to thicken the broth. You want it to be nice and creamy! Serve in a big bowl so you get plenty of tasty dumplings! 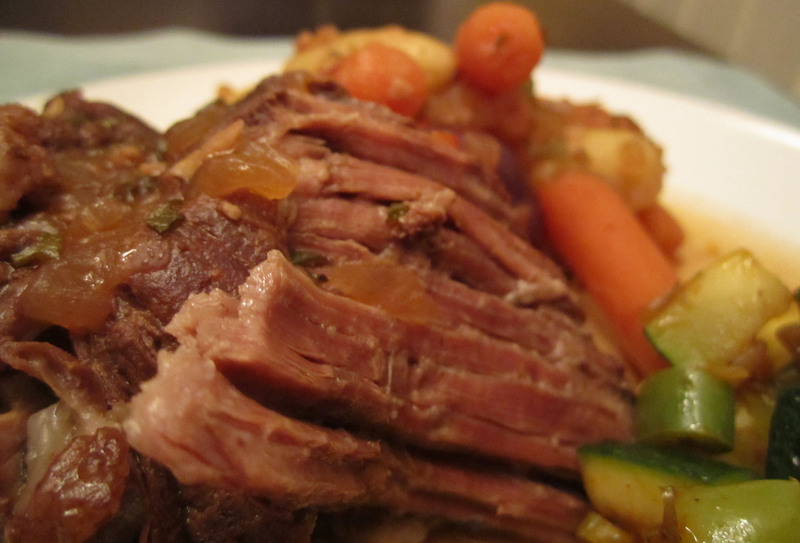 Time to switch up the usual Sunday pot roast for braised short ribs. Similar to pot roast, this is a one pot meal that takes little time to prepare but yields unbelievable results. I’m always amazed at the complexity of flavor that evolves without having to do anything but stick it in a pot, pop it in the oven and forget about it until dinner. This would be great for a dinner party, since you can prep everything ahead of time and take it out of the oven when your guests arrive. You could even make it the day before and then reheat it on the stove, my only recommendation would be to test the broth the second day to make sure it didn’t concentrate too much, if so, just add a little chicken or beef stock. 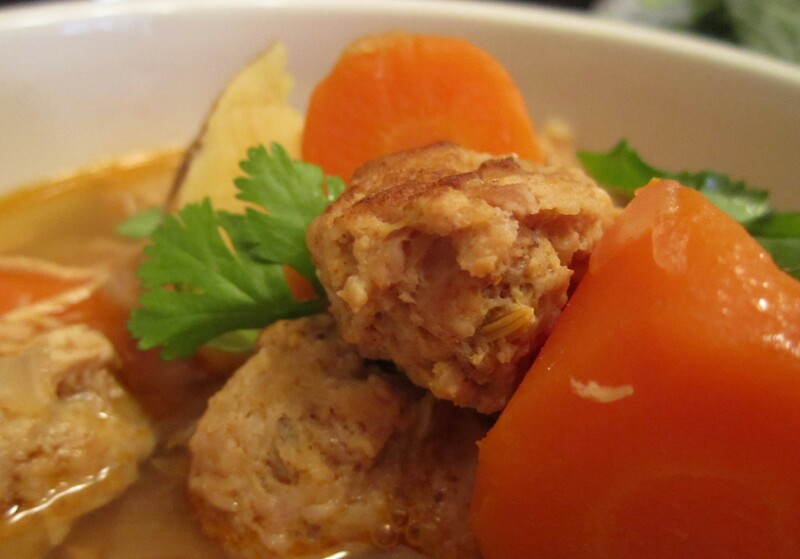 The depth of flavor develops as it braises, and it’s almost impossible to over cook. Who doesn’t like fall off the bone ribs? Pop in some carrots and potatoes after a few hours and they will cook in the meat juices… there you have it, a side dish! Make sure ribs are dry, and sprinkle with salt and pepper. Heat oil in a wide 6-8 quart heavy pot over medium-high heat, then brown ribs on all sides. I used tongs to turn them every 4-5 minutes and sear them on each side. When done, remove from the pot and leave them on a plate until later. In the same pan, reduce heat to medium and add onion, jalapeño, garlic and sprinkle with salt. Cook about 6 minutes until the onions are translucent. Stir in tomato paste, red wine, vinegar, stock and water and bring to a light boil for 5 minutes. Add bullion cube, thyme, rosemary, sage and bay leaf and simmer for 5 minutes. Add ribs back to the pot along with any juices. Cover pot tightly and transfer to oven. Braise ribs until meat is very tender, 2 1/2 to 3 hours. After 2 hours, add carrots and potatoes and continue to cook. Remove from oven when meat is tender, stick a fork in it and twist, if it moves easily it’s done. Let stand, uncovered, until fat rises to surface, about 15 minutes, then skim fat with a metal spoon. Pull chunks off meat off with tongs and serve in a bowl. Remember to grab some off the potatoes and carrots and spoon on lots of broth. We had this over the weekend, and the meat was perfectly tender and had amazing flavor. I served it on a plate with a side of potatoes, carrots and zucchini hash. In the process of cleaning up I took a spoonful of broth to see how it tasted on it’s own and it was AMAZING! I highly recommend serving this in a bowl (I put it on a plate so I didn’t get enough broth but will know better next time). 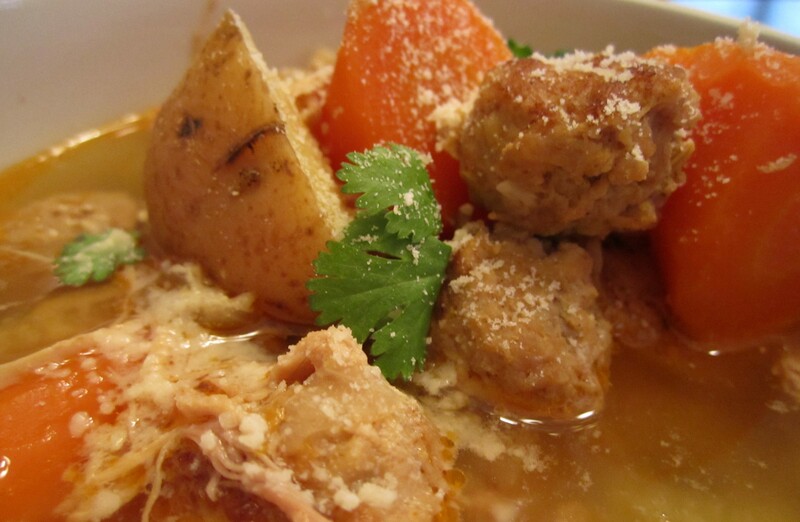 The broth is where all the wonderful flavor lies, you can taste the garlic, herbs, meat juices…. it’s divine. I’d treat this more like a meaty stew so you get a good portion of brothy goodness to meaty ribs.